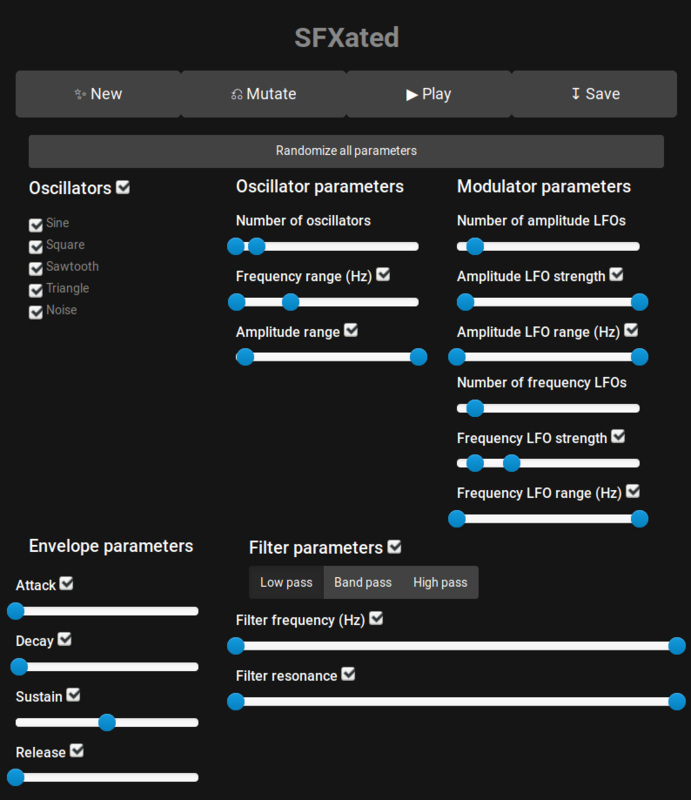 SFXated is a browser-based sound generator which allows for a wide range of modifications. The sliders express either values or the extents within which a specific setting will be changed. For example, it's possible to only generate oscillators that play at between 60-240 Hz. The checkboxes next to the sliders allow for selective modification ("Mutation") of only parts of the sound. Modifiers, filters and the envelope behave in the same manner to their equivalents in other audio-editing programs. New creates a new sound with the selected ranges in mind. Mutate changes only those parts of the existing sound that have the checkbox next to them checked. It will not add new or remove old oscillators, but it can change their type. Play plays the current sound. Save lets you download the generated sound as a .WAV file. Randomize all parameters changes every parameter available, generates a new sound and plays it. "Sound effects generated with SFXated by Inkblot Games, https://inkblot.itch.io/"
and link to the license itself: https://creativecommons.org/licenses/by/4.0/.